'It's Insane. It's Crazy:' Gunman Kills Four, Then Himself, In Minneapolis : The Two-Way Four other people were wounded. Early reports indicate the gunman was a former employee. People who live near the business are in shock. In shock: The scene outside a Minneapolis business Thursday. 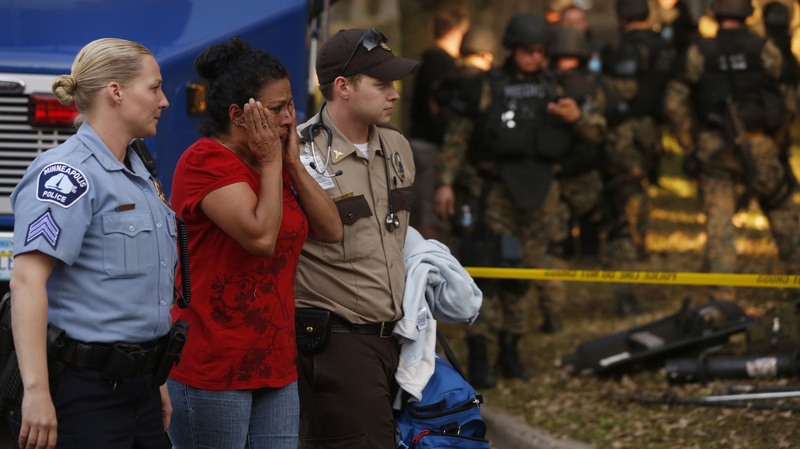 A gunman killed four people, wounded four others and then killed himself. The early signs, as The Star Tribune reports, point to "a man who apparently had just lost his job" at the company as being the gunman. He apparently "opened fire, killing the company's founder and three others and wounding four others" before committing suicide. Three of the wounded are reported to be in critical condition. St. Paul's Pioneer Press says "police radio traffic during the incident indicated the killer had been fired from Accent Signage Systems earlier in the day." People who live in Minneapolis Bryn Mawr neighborhood, where Accent Signage had its offices, are in shock. "It's insane. It's crazy," neighbor Heather Buckingham told KARE-TV. "I know the guy, I know all the people." The TV station adds that Accent Signage is a small company with a "rich history [and a] global impact." It "holds a patent for technology that imprints Braille on things like hotel room numbers and restroom signs ... employs about 30 people and earns $5 to $10-million dollars each year." Minnesota Public Radio has a story and photo gallery here. Update at 9 am. ET. Owner Of Company Was "Super Smart ... Charismatic." "Reuven Rahamim, the owner of Accent Signage Systems Inc., where the shooting took place, was among the victims, said his son-in-law, Chad Bluemnfield. "Mayor R.T. Rybak said he had toured the business about a month ago, and described Rahamim as a 'super smart' and 'charismatic' Israeli immigrant who had started 'a classic family business.' "